Florida Gov. 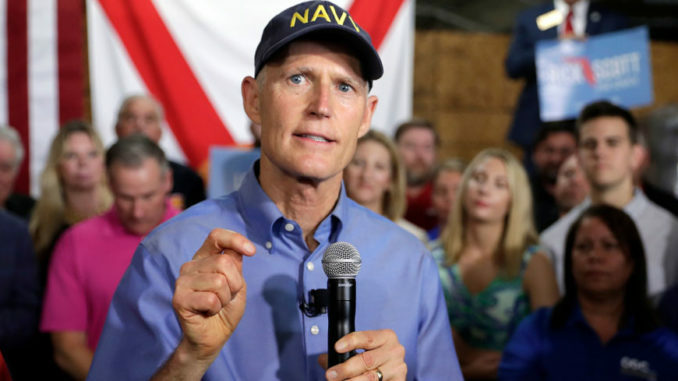 Rick Scott has accused his opponent’s campaign of “preparing” to steal the election for Florida’s next senator. Scott’s campaign spokesman, Chris Hartline, said Democrat incumbent Sen. Bill Nelson “won’t be successful” in his attempt to steal the election. Infowars.com reports: Hartline’s comment was a response to another tweet saying Nelson’s recount attorney, Marc Elias, was not afraid to sue the state of Florida. “A U.S. senate seat & a statewide cabinet officer are now potentially in the hands of an elections supervisor with a history of incompetence & of blatant violations of state & federal laws,” saidRubio’s Thursday tweet.